When you walk through the gates at Saint Patrick Catholic School, you become part of a community that embraces you as part of a family. 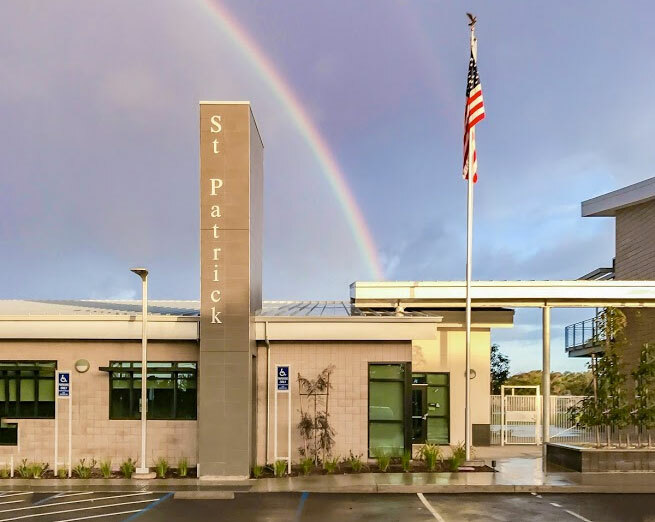 For over fifty years “Saint Pat’s” has been committed to spiritual formation and academic excellence in an environment rooted in Catholic values and the teachings of Christ. A school of nearly 500 students, our accredited academic program exceeds national standards and stresses a personal approach to the education of the whole student through diverse academic, athletic and co-curricular programs. The school’s passionate commitment to serving others – we call it “being the light” – provides leadership and community service opportunities that help nurture St. Patrick’s students into becoming compassionate, highly respected young adults. St. Patrick’s, a pillar in the Carlsbad community, is proud to instill faith, leadership and knowledge in our youth. St. Patrick Catholic School fosters a community where students grow in faith and knowledge in order to bring Christ’s light to the world. We, as educators, serve our community as a ministry of the Catholic Church. We believe faith formation is essential in the development of a child. We recognize and support parents in their role as the primary educator of their child. We believe every child can grow academically to meet the challenges of our changing world. We guide students to be responsible citizens who serve others.